To better serve its growing client base, RDHB CPAs recently completed an office expansion and renovation that effectively doubled its workspace. The additional square footage enables even greater collaboration among RDHB’s staff and its clients in order to help them prosper and grow alongside RDHB. 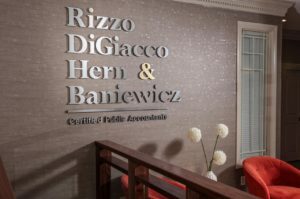 The Pittsford-based, boutique accounting firm purchased a neighboring property in April 2016 and partnered with Hamilton Stern Construction to combine and refresh the office spaces. The expansion added 3,000 square feet to RDHB’s offices, and the renovation included not only office spaces but a new reception area, new conference rooms and collaboration areas, a training room, and a kitchen. Throughout the three-month renovation, RDHB never closed its doors. Employees and clients were able to work amidst the construction, and the new office is now open. RDHB CPAs provides its clients with personalized tax, business planning, accounting, auditing, and wealth management services. For more information, visit www.rdhbcpa.com.